It is the intended use of the product that determines what it is. Oddly enough, it can be the exact same product formulation, but it could be classed as different types of products depending on what you say is its intended use. This is such an important concept to understand … the intended use is the determining factor for what the product IS. Seems crazy and backward (and pretty much is crazy and backward) but that is how you determine how to label your product and what the applicable regulations are. Soap is the worst possible offender – and the most confusing – because the same bar of soap can be so many different things! Take a bar of cold processed soap that contains lavender, tea tree and citronella essential oil – it could be a soap, cosmetic, drug or insect repellent, just because of what you say it will do (clean, mosturize, cure acne or repel insects, for example). You’ll often hear people talk about “making claims” for a product. The claims are what you say the product can do, which is what determines the intended use. Mind you, these are not just the claims that are made on the product itself; it is also all the claims and statements you make about the product in brochures, on display signs, in website product descriptions, even in Facebook posts or Twitter tweets about the product or customer testimonials. Not only that, the claims made for an ingredient can (and frequently do) help decide the intended use of the product. The bottom line is that the intended use is what the consumer thinks it is … and the consumer determines that based on the claims that you have made for the product and the ingredients. If you claim that the product “reduces the itchiness of poison oak” or is a “poison oak soap,” then the consumer thinks the intended use is to “treat poison oak” or “mitigate the effects of poison oak” — and so the product is a drug. If your product contains lavender and you say that “lavender oil is known to soothe itchy skin,” then the consumer thinks the product is intended to “treat itchy skin” (otherwise why would you have mentioned it?) — and so the product is a drug. WHAT the product is (based on the intended use) determines not only the agency responsible for oversight and regulation of the product, but also which laws and regulations apply. Soap, provided it is “the alkali salt of fatty acids, is identified as “soap” and only claims to clean) is regulated for SAFETY by the Consumer Product Safety Commission, and for LABELING by the FTC. No registration of facilities or products is required. Label: The label requires identy of product (soap), net weight and name and address of manufacturer or distributor. Ingredients are not required. GMP: The product must be safe, but good manufacturing practices are not required in the regulations. Cosmetics are regulated by the FDA. Soap is considered a cosmetic unless it meets the exact definition (given above). No registration of facilities or products is required at the federal level. Some states do require facility and/or product registration before products may be made or sold. Label: Label requires the identity, net weight, name and address, and ingredient declaration. GMP: The product must be safe, but good manufacturing practices are not required in the regulations. However, the FDA’s GMP Inspection Checklist is used as a guideline for determining whether a product is likely to become unsafe (adulterated or misbranded) – so if your GMP isn’t reasonably in place, then the product will be considered “likely to be adulterated or misbranded” (read “unsafe”). Additional: Color additives must be on the list of color additives approved for cosmetics. Some products (bubble bath, sunless tanning products, feminine hygiene products, for example) require mandatory warning labels. Drugs are regulated by the FDA and most states also have regulations. Over-the-Counter drugs must meet specific requirements to contain ingredients which are known to meet the intended use of the OTC product (called “OTC drug monographs”) . Prescription drugs must be fully tested and approved by the FDA prior to marketing or sale. Drug manufacturing facilities must be registered, inspected and approved by the FDA (and possibly at a state level as well). Label: Label requires the identity, net weight, name and address. Ingredient declaration is required and must include the percentage of active ingredient(s) and all inactive ingredients. There are additional requirements for what may be said on the label (marketing text), what claims may be made, the inclusiveness of directions for safe use and any necessary warnings and how they must be presented. GMP: Good manufacturing standards are required in regulations and are a prerequisite for manufacturing approval. Additional: There are substantial other regulations and laws pertaining to the manufacture and sale of any type of drugs. Insect repellents are regulated by the Environmental Protection Agency and most states also have regulations. All insecticides must be fully tested and approved by the FDA prior to marketing or sale. There is a small window of exemption for insecticides using “safe” ingredients (such as citronella) which don’t need prior approval by the EPA. State regulations may vary, however. Manufacture of food and nutritional supplements is regulated by the FDA and the federal level and by states at a local level. Food manufacturing facilities require registration, inspection and approval. Label: Label requires the identity, net weight, name and address, and ingredient declaration, as well as nutritional information and various other things. Additional: There are many, many regulations covering food and nutritional supplement manufacturing and marketing. Before manufacturing any type edible or ingestible product, be sure you know what local, state and federal regulations apply. When you create a handcrafted soap or cosmetic product, always be aware of the intended use you envision for the product. It is your decision and vision that will ultimately determine where your product falls in the regulatory scheme of things and what you need to do to ensure your product and actions are legal. This is so clear and easy to understand. Thank you! Can you label soap for a specific body part without changing its intended use? I.e. Face soap, hand soap, foot soap? I don’t think that stating a specific body part would make a difference, provided no other claims were made or implied. How I wish your posts were MANDATORY reading! What are the warnings required for bubble bath? Bubble bath that is intended for adults does not require a warning label, but it must say “Keep out of reach of children” or “For adult use only” on the label (informational panel is okay). What about using the phrase “hand sanitizer” ? Does using those words make your product a drug? Hand sanitizer is a drug (as is anything that is “antibacterial”). Certain ingredients can qualify a product as an over-the-counter hand sanitizer or antibacterial product, but they are still drugs and even thought the product wouldn’t need pre-approval (so long as it met the requirements), you would still need to be a registered, inspected and approved drug manufacturer in order to legally make the product (and it would require drug labeling). Does a bath bomb have the same mandatory label requirements as bubble bath? Yes – a bath bomb is a cosmetic product. It doesn’t, as far as I know, required the bubble bath warning label unless it contains detergent/soap. Thank you for stating the categories and requirements so clearly! We make several true soaps with additives such as ground oatmeal, ground barley etc. Can we say the soap is “exfoliating” or will that move us to the Cosmetic category? Exfoliating is a cosmetic term. Thank you for all your helpful info. I was wondering if you know how/where to find what the state requirements are (as referenced a few times in the above article)? I contacted my state Dept. 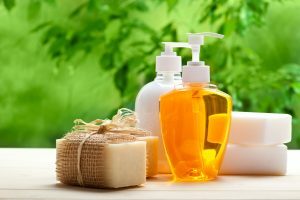 of Agriculture, Weights and Measures, and found out I don’t have to register my scale, but they said I have to list a price on my label for soap (I have not heard anyone say this before, nor have I seen any soap packages contain this information…have you heard of this before?). I would like to make sure I meet all other state requirements (i.e. is there facility/product registration for my body butter in my state?). Thank you so much for the time you invest in helping us learn and understand the regulations that can be tricky to interpret :). I’m not up on ALL the state regulations – most states just follow the federal guidelines. What state are you in? I’m guessing on the requirements for your state from the Dept of Ag — they probably require the price on the package IF the package is being sold by weight. That is, you are selling the soap for $2.00 per ounce and your bars are slightly different sized … so a 4 oz bar would be $8.00, but a 3.5 oz bar would be $7.50. If you ask them for the applicable regulation, you can email it to me (hello@mariegale.com) and I will take a look at it. I am so overwhelmed. If I sell a balm that is made with a dozen herbs known to heal cuts/scrapes/abrasions, how can I even label it? If I just say that it’s an herbal balm, people will have no idea what it is for and will not buy it. How can I sell a “face moisturizer” or an “anti-aging oil” without claiming that it will improve the appearance of fine lines and wrinkles or keep your skin supple? It seems redundant that with thousands of scientific info and books on the market that support the abilities of these ingredients, that we are basically unable to sell them to anyone because we can’t tell them what to use it for. Do these products need to be tested by the FDA? What are the costs associated? I’m completely freaked out. Hold on here – you are talking about two different things. An herbal balm that heals cuts and scrapes and a moisturizer that makes your fine lines look better are completely different. It comes back to the INTENDED USE. If your intended use is to prevent, treat, mitigtate or prevent disease or the intent is to alter the function or structure of the body, you have a drug. The herbal balm you described in your comment IS A DRUG. As such there is no way that you can possibly make that product and meet the requirements for manufacturing a drug. If you make the claims that it will heal cuts scrapes, or abrasions you are marketing a new unapproved new drug. On the other hand, if the intent is to “improve appearance” or “beautify,” then you are dealing with a cosmetic. You can make and market it without any preapproval (in most states). A cream that makes the skin APPEAR more youthful is just changing the appearance. It is cosmetic. It is not making the skin actually younger … just LOOK younger. On the other hand, the statment “anti-aging” has no qualifiers. It says you are actually going to stop aging or get younger. Not only would that be changing the function or structure of the body (drug), it’s also false and misleading since so far we don’t have anything that actually makes you get younger. Part of it is in the words you use to describe your product (particularly when it comes to cosmetics). Part of it is in realizing that if you are really making a product that you intend to sell to treat or heal disease or physical body problems, then you are making a drug. I AM THINKING ABOUT TRYING MY HAND AT SOAPING AND IVE BEEN READING AND LEARNING ALOT BEFORE I EVEN GET STARTED. I LIVE IN OHIO AND AM WONDERING WHERE SHOULD I LOOK TO FIND OUT WHAT IS REQUIRED OF MY HOME IF I’LL BE MAKING SOAP HERE. As far as I know, the Ohio statutes are very similar to the Federal statutes. You don’t need any pre-approval or other licensure from the state to make soap or cosmetics. Do check with your county and city to see if there are any zoning or licensing restrictions though. There has been a recent change on the use of anti-aging claims … I am doing some research and will be putting up a blog post on it in the near future. I am reading all your articles and intend to buy your book also and I am trying to figure out not only what I cannot say, but also to find a way to describe my products. An article about what language we can use with plenty examples would be so useful, but I know that since FDA has not a list like that, it is a bit difficult to guarantee what is ok to say. I was also wondering if it is ok for FDA blogs to talk about herb properties. I assume that they only forbid claims on sold products and they don’t at least forbid expanding the knowledge about natural remedies. I had so many questions (these are my last ones 😉 )and I really thank you for all your time and care! You are so helpful! The key is the “intended use” of the product. “Muscle massage oil” implies that the intent would be to “treat” sore or damaged muscles … so it would be a drug claim. “massage oil” (even though massage is applied to the muscles) would be more a cosmetic claim because it smells or feels good. “Evens out skin tone” is tricky … if it does so by actually lightening dark spots (or saying that it does), then it is altering the function or structure of the body, and so is a drug. If it is to cover the unevenness with some product (ie makeup foundation – or even that redness concealer that works with reflective particles) – then it is only a change in appearance and is a cosmetic. Removing dead skin cells is an exfoliant and is a cosmetic. “Soothes” dry, sensitive skin is just making it feel better. If it TREATS dry or chapped skin, it is a drug. Really look at the words you are using and the intended use they convey TO THE CONSUMER. Is the intended use to change the APPEARANCE (and so the “change” is temporary and a surface change)? If so, it is a cosmetic. Is the intended use to make a functional or structural difference in the body or to treat or lessen a physical issue (treat chapped lips, remove scars and stretch marks, lighten dark spots, restore sore muscles, etc) ? If so, then it is an unapproved new drug (and illegal).